Last year, we released “Social Wind,” the first-ever study of social media use by major players in the wind industry. If you didn’t see it then, it’s still worth a read. You can download it here. In short, we found that while wind companies were on the major social media platforms, they largely use them as cheap distribution channels, not engagement tools. Social media platforms, and the closely related content and inbound marketing tactics, are built to facilitate two-way conversations. But wind and other major cleantech sectors rely on distribution-only or distribution-mostly strategies that leave most of the marketing communications (“marcom”) power of these tools on idle. This year, we looked at why that happens. A few external drivers explain a lot. We mapped the business world to a spectrum that we’re introducing as the “Digital-Social Criticality Scale.” It’s an organization of the business world, arranged by the types of companies that most need to execute digital and social strategies effectively. As you go from left to right, our Scale starts with companies for which effective use of digital and social tools are critical. These are pure-play, online only companies with point-of-purchase websites. Our friends at Thrive Market have to establish customer relationships with food products that customers can’t experience in person like they can do when shopping at Thrive’s bricks-and-mortar competitors. That’s a real challenge, and Thrive has to get digital-social down pat. (And they do!). 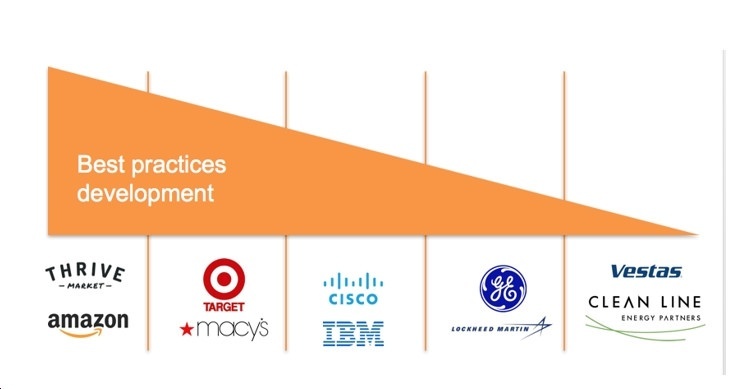 For these companies, if their digital and social play is weak, they’ll die – and quickly. 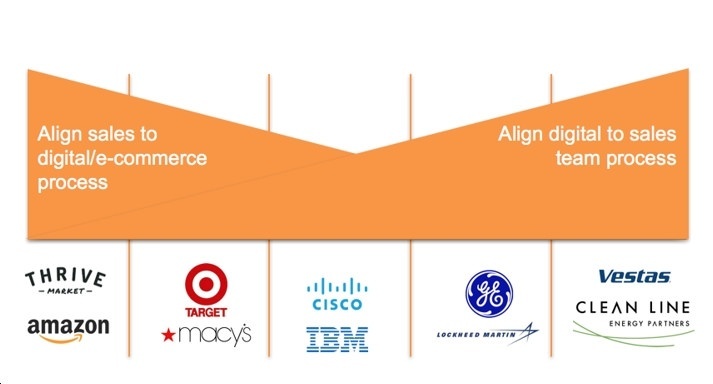 The next category over are B2C companies with both physical and online points of purchase, such as Macy’s. As we write this, I (Mike) am wearing clothes I shopped for in person but bought online at Macy’s. But if that chain’s digital-social is weak, I’ll just buy the pants on Amazon. With enough of that sales bleed, Macy’s would die too – but more slowly than Thrive. And so it goes, over to the right side of the graph. That’s the sector inhabited by B2B industrial companies selling high-ticket products and services to customers who conduct a lot of due diligence on purchases. And, it’s where most of the cleantech industry lives, including: OEMs (original equipment manufacturers), developers, financiers and asset management firms. Our Scale suggests why the bulk of the best-practices conversation around how to use digital-social to boost sales is bunched at the far-left end. For those companies, customer engagement happens online (mostly on mobile), so the demand for expertise and the build-out of best practices have been strong. On the other hand, for industrial B2B companies with high-ticket, specialized products, digital-social has mostly occurred as non-essential, “nice to have.” Some marketers have made the case for stronger B2B adoption (here, here, here and here), and B2B companies with market pull-through needs have developed robust approaches to digital marketing. But for industrial B2B, such as the solar and wind industries, it’s been pretty thin air to breathe. After all, no one’s ordering high-voltage transmission lines with a single click at 2 AM, right? But here’s the emerging cost to slow-walking digital-social investment: The trend among buyers of practically every stripe is to do more research and shopping online before seller contact. B2B customers are almost 60% of the way through the “buyer’s journey” before communicating with a sales person, according to CEB (the former Corporate Executive Board). 93% of the buying process begins with an online search, Ironpaper found. The growing verdict is that this is an across-the-board trend among customers, whether it’s books, cars or wind farms. Doubt the findings above? Look at your own browsing and information consumption patterns. What do you view, and what do you delete? Everyone is demanding shorter content in more entertaining formats – and browsed at his or her own pace. The reality is declining patience for unprompted seller contact and increasing reliance on self-guided research and consideration. It’s the decay of interruption-based marketing’s effectiveness in favor of greater search and content consumption by buyers. This trend is playing out unevenly on the digital-social criticality scale, but the overall trend is becoming a law of marketing physics. That means there’s a growing cost for clean economy executive teams in treating digital-social as a “nice to have.” Customer prospects are harder to reach because they want to find information online before engaging with sales teams. As B2B industrial marketers, we need to solve for this challenge with a body of best practices borrowed from the B2C digital marcom repertoire, but adapted for the realities of companies without point-of-purchase websites for big-ticket, high-due diligence products. We (really Sarah) are asserting that there are several steps for cleantech players to take in seizing the marcom power of digital-social tools. Recognize the critical difference between the two ends of the Digital-Social Criticality Scale. Companies like Thrive Market sell to millions. The wind, solar and battery companies often market to hundreds. Ask these questions: Are you finding it harder to contact customers through a retail-only approach? Is there a reason why your customers are the exception to everyone else in the country in making more of their purchase decision online before actually buying. Examine how developed are the profiles you have for each sales prospect? It’s an advantage that you’re marketing to hundreds. Not only can you develop highly accurate customer personas, you can sync them to the development of the profiles of individual customers. Integrate the use of digital-social tactics closely with the way sales teams operate. When we begin working with large cleantech companies, we often find them letting a lot of customer persona information live in the heads of individual sales reps. Effective social-digital marketing can provide a wealth of targeting information, and much of it is easy to sync with CRM platforms, such as Hubspot or Salesforce. That data resource alone demands a greater investment in digital-social engagement, not cheap distribution through digital channels. Align goals, objectives and targets with the sales team. The further to the right you get on our Scale, the more important is the alignment of sales to your marcom efforts. The number one recommendation from the Salesforce 2017 tips? Use content to sell, like we’re doing in our new company video. The task for the cleantech industry – wind, solar and storage – is to stop leaving digital-social’s marcom power on idle. We can do that by adapting the best digital marketing practices to the reality of marketing to hundreds. The heart of that task is integrating digital marketing with the efforts of existing sales teams. We’re going to address the “how” in the next post, which we’ll have up on Scaling Green during WINDPOWER trade show and conference this week in Anaheim.